I’m delighted to offer an autographed copy PLUS a $25 Walmart gift card to purchase ingredients to enjoy the 100+ stress-free recipes, each requiring 20 minutes or less hands-on prep time. By the way, thank you to all my BFFs who’ve sent me sweet notes and photos of you and your kids or grands bonding over the easy recipes and delicious results of time together in the kitchen. It totally thrills my heart to have a small part in the forever memories you’re making together! 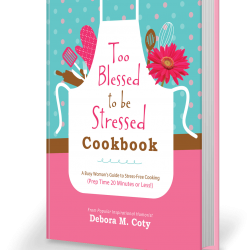 So for those of you who haven’t gotten your own copy of the Too Blessed to be Stressed Cookbook yet, or would like to share the gift with someone else, all you have to do is send me your favorite cooking memory and you’ll be entered in the Cookbook Memory Giveaway. The drawing will be on July 1; winners will be announced on my blog (so be sure and subscribe to my blog while you’re here at http://deboracoty.com/too-blessed-to-be-stressed/ so you won’t miss a thing!). WooHoo – and a bonus! I might just be sharing some of your fave cooking memories on my blog as well, so look for your name in lights!